My tenacity is fragile. Finally noticed today that I hadn’t gotten one of those annoying Post A Day prompts in my email for a while. Somehow I was missing the annoying-ness. Went to the Daily Post blog, and found out I have been out of the loop for 8 days now…. Whaaaat? Could’ve swore I was subscribed to the Daily Post blog, and went to login and There It Was: Incorrect username or password…. Did you forget your password? Click here, you moron….. or something like that. Then it told me my Browser Was Blocking Cookies. 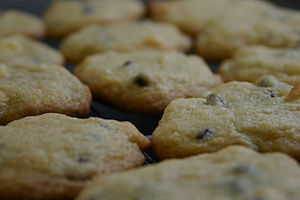 I would never block cookies– they might be chocolate chip! Not only was I wrong about my username and password, I also had pending charges of assault against my favorite junk food companions. Life was bad. Considered changing my username to WonderlandAirhead, but was immediately reprimanded by: You Cannot Change Your Username. I don’t know what is worse, that I got cut off from the loop, or that I didn’t realize I was cut off from the loop. Cut off from daily blog post “prompts” (aka Demonic Demanding Arbiters of Anguish (DDAA)), I conveniently just didn’t notice and wantonly participated in vain distractions and……. something. Ask my teenagers, I’m sure they would have noticed my criminal behavior towards baked goods. Filed under Blogging, Mom-ness, Post A Day 2011, Stuff and tagged acronyms, blog, boring motivation, chocolate chip cookies, cluelessness, cookies, Daily Post, distraction, life, paranoia, postaday2011, teenagers, username, wannabe, WordPress, writing |	Comments Off on Post A Day Wannabe…. Has anybody seen my muse? Post A Day wants to know how I find it. Gotta tell you, I don’t find my muse– it find’s me. I have no idea from whence it comes, but it suddenly descends and a torrent of words comes Pouring Out My Fingers. Many times, if writing on actual paper, I will sit and stare at it in awe after I’ve gotten it all out of me. Where did that come from? I’ve been told I “Have A Way With Words.” The truth is words have a way with me. I don’t go searching for them, they come at me and I link them, absorb them, try to communicate them and Share The Joy I Experience with others. I love play on words, bizarre acronyms, bilingual word plays, and epic metaphors. They give me life, they make my world colorful and exquisite. Apparently, other people don’t experience this, which I think is very sad. Ha, I have an extensive vocabulary, yet I choose to use a simple description “very sad.” Maybe my vocabulary is a big part of my muse, the delight in finding a way to express something in an unexpected way. Then play with even that by incorporating the extremely simple, everyday, colloquial, slang. If there isn’t any appropriate slang laying around, make some up! Likewise with grammar, speaking inside out is a blast, if even for all the confusion on the listener’s face. Don’t even get me started on punctuation…..
Cola Slurpees, definitely. Alone in my car, turning up the volume and bass to max (I’m Deaf) and playing rap music. My particular car causes even the gas pedal to vibrate to the music. Putting my arm on the car door is great! Sometimes the drivers seat gets involved in the beat too. Risk: police officers don’t usually understand that all that racket is Not Distracting Me From Driving at all. My children are embarrassed when I’m waiting in the carpool lane. They say You Can Still Hear It really loud half way across campus. Going to Dog Beach when the weather is good. Getting visitors to my blog. Inventing play on words across ASL and English. Only about 2 people in the world understand them, but I amuse myself at my ingeniousness. This is an Eccentric Result of losing my hearing as an adult and being bilingual…. Filed under Post A Day 2011, Stuff and tagged beach, bilingual, blog, cola slurpees, Deaf, dog, happiness, life, loud, postaday2011 |	Comments Off on What cheers me up….